Well known for his mixing skills, John Macraven gained a lot of respect by other Dutch DJ’s. Through the years he had the privilege to perform with many of Holland’s finest and best known dj’s and artists. ‘I’m there for my crowd and that makes me happy’. With already having residencies in many of Hollands most popular club’s on his name, he is now ready to take things to the next level with his productions. 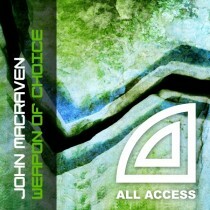 “Weapon of Choice” is a BigRoom track that does make the crowd happy!